This type of list has been very useful for me. I tend to have these lists at the back of my Smythson manuscript books. I use one manuscript book per year for general notes that I don’t need to keep. 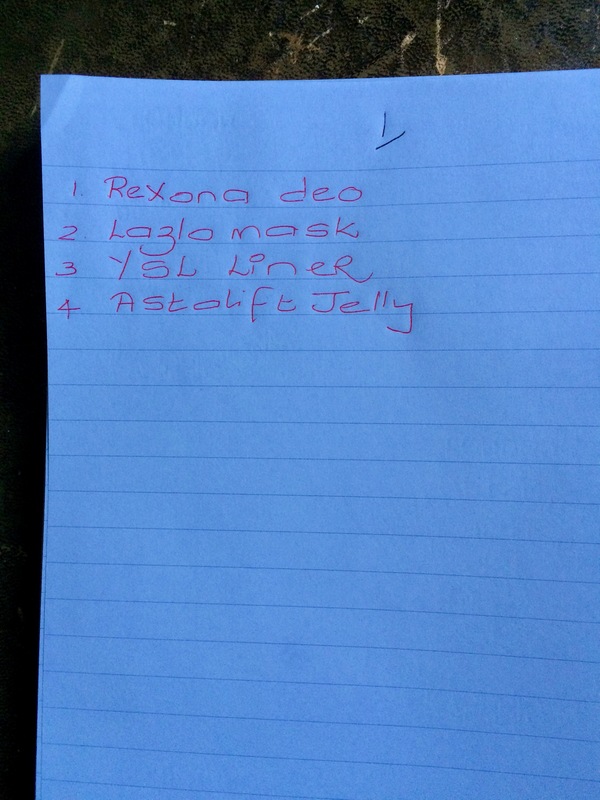 This particular list records all beauty products and toiletries I have finished. I tend to buy my go-to toiletries on sales (3 for 2, 50% off etc). I know I will always use things like body lotion and shower gel so I tend to stock up on my favourites two or three times a year when they are at really good prices. It does mean though, that sometimes I end up with too much of something and have to use up my stockpile before I buy anything else. So this list has things I have finished written in red and things I buy written in blue. I aim to have one page of finished items for each one item I buy. I have been doing this for ten years now and I really enjoy it. Some bloggers write about items they have finished each month. At the end of each month describe all the items they have finished, review them and say if they would buy it again. I have toyed with doing that. I also keep a list in my manuscript book of things I have up for sale at auctions, on sales sites, and in consignment stores. When they are sold I put a tick next to the item. This is particularly important at the consignment shop as they don’t describe the rings I sell, just put for example ‘6 rings’ on the receipt. I have a list of them so if they lose one or don’t keep track of it, I know which one has slipped through the cracks. I have toyed with keeping a list of the things I have gotten rid of, to motivate me to keep going. But there have been so many of them and some of them are so small that I didn’t have the energy. As the number of things I need to get rid of reduces, that may be something I consider.